Do you want to build a forum and you want it to be on a sub domain of your existing website/blog because you ain’t ready to purchase a separate hosting for it? I once setup a forum on a sub domain for testing reasons and It was easy and simple and an example of a sub domain is sub.yoursite.com. If that’s exactly what you want to do on your own domain, then you’re in luck today. We’re going to discuss it step by step and I want you to read carefully and understand every bit of it. Before we build a forum on a sub domain,we’ll need to create a sub domain where the forum will be built on. The easiest way to create a sub domain is to use your web hosting account’s cpanel. 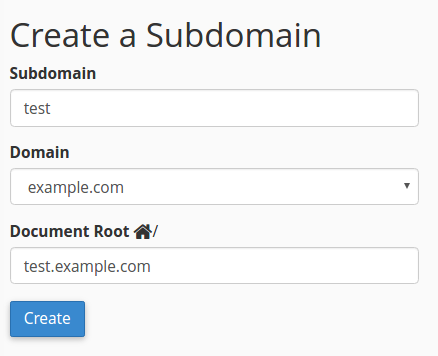 Type in the name of the sub domain and select the domain to create it under. It will automatically create a folder for the sub domain in your public_html folder. Wow! Now, that you’ve created your sub domain, we’ll now install WordPress to it. So, since we’re building a forum on a sub domain, and we’re building it with “bbPress”, we’ll add a second installation of WordPress to your sub domain. Note : Do not install WordPress to your main domain name or it will overwrite and everything and unless you were backing your website up, you’ve totally lost your old blog. Always back up your blog contents in case of mistakes like this. So, when installing the new WordPress, select the sub domain you just created, that’s where it’ll be installed to. Having installed WordPress, we’ll now look forward to creating your long-awaited forum with “bbPress”. In the Search text box, type bbPress, and then click Search Plugins. In the Name column, locate bbPress, and then click Install Now. In the left-hand pane, click Forums, and then click New Forum. Under Create New Forum, type a name for the forum in the text box. WordPress displays the permalink URL to the forum. In the large text box, type a description for the forum. Under Forum Attributes, specify the forum settings that you want. To publish the forum, click Publish. To spice up the whole thing and make your forum look interesting, we’ll be adding BuddyPress to it. BuddyPress is a free software package that can be plugged in to WordPress to create a social networking website. For newcomers, think of BuddyPress as an out-of-the-box social networking website, complete with an administration area that lets you manage the site. BuddyPress is a plugin for WordPress. Forums like ask.shoutmeloud.com, radar.techcabal.com, planet.ogbongeblog.com etc are powered by discourse.org. Discourse is one such popular forum software that is quickly becoming the favourite choice of several websites. The software’s integration with WordPress was one of the widely requested features. Keeping such requests in mind, Discourse has recently released an official WordPress plugin that makes the integration really easy. The WP Discourse plugin enables you to use Discourse as a community engine for your WordPress blog. As you install and configure the settings for WP Discourse plugin, you will explore several features of the plugin but here’re the main highlights of what you can achieve with the plugin. You can easily install the plugin by searching for WP Discourse within your WordPress dashboard. Follow the quick instructions below. Install and activate the WP Discourse plugin. Alternatively, you can download and upload the ‘wp-discourse’ folder to your ‘/wp-content/plugins/’ directory and activate the plugin from your WordPress dashboard. Once you have installed and activated the WP Discourse plugin, head over to Settings > Discourse where you will need to configure settings to connect your WordPress blog with your Discourse forum. First, you will need to fill in the values for common settings that establish the connection between two platforms. You will need to fill in the settings for ‘Discourse URL’, ‘API Key’, and ‘Publishing username’. You should also have already set up your Discourse forum at this point. See the screenshot above for common settings. Next, Publishing Settings allow you to choose your category and the ability to publish all new posts to Discourse. You can also opt to publish the full post for content rather than the default excerpt and define post types to publish to Discourse in this section. You can choose to replace WordPress default comments completely or add Discourse forum discussions in addition to your WordPress comments for Discourse published posts. The settings in this section also allow you to define and configure other comments related features. SSO Settings allow you to enable single sign-on between your WordPress site and your Discourse forum. Check the box next to Enable SSO and fill in the SSO Secret Key for the single sign on to work. You should also configure the SSO settings for your Discourse forum available under – Admin\Settings\Login section. Then SSO Secret Key settings here at WordPress blog should match the value for SSO Secret that is entered on your Discourse forum settings. That’s a long one right? Well, you can now setup your forum and build a forum on a subdomain easily. If you need help, Feel free to contact me and I’ll personally help.